Among the many things I had hoped never to see in life was George Clooney flying through the air with a jet pack strapped to his movie-star back. In Gravity, Clooney floated over the earth as an astronaut. But in Tomorrowland, his late-picture airborne antics seem almost cartoonish. And as much as I support efforts to save the planet, I had no desire to hear an Imax-scaled lecture about it, which is pretty much what happens at the end of Tomorrowland, an ambitious but not entirely satisfying addition to summer’s box-office sweepstakes. There’s a good deal of anticipation about Tomorrowland, not only because of Clooney, but because Tomorrowland was directed by Brad Bird, a Pixar veteran who has acquired avid followers for his animated work in The Incredibles and The Iron Giant. In addition, the screenplay for Tomorrowland was co-written by Bird and Damon Lindelof, best known as the show runner of the popular TV series Lost. Bird certainly hasn’t made life easy for himself with Tomorrowland a large-scale production that demands lots of heavy imaginative lifting, particularly when it comes to the movie’s vividly realized production design. Bird and his team try hard to keep the visual environment stimulating, but it’s the movie’s foreground — a somewhat confounding story — that troubles. Clooney plays Frank Walker, a disillusioned guy who opens the movie talking directly to the camera while being interrupted by an unseen character who’s trying to give him directions about how he should tell his story. We later learn that Walker’s off-screen tormenter is none other than Athena (Raffey Cassidy), who appears to be a girl of about 12. I don’t think it’s a spoiler to tell you that Athena is a highly developed child robot, another striking example of how far artificial intelligence has progressed — at least in the movies. As it turns out, Walker’s telling a story about how, as a boy, he visited the 1964 Worlds Fair in New York and was transported to another dimension. That would be Tomorrowland, the alternate universe where young Frank cemented his relationship with Athena. At that point, Clooney goes on sabbatical for a while, and another plot development takes over. 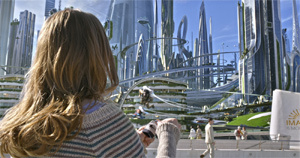 A perpetually avid young woman (Britt Robertson) also travels to Tomorrowland. As it turns out, these young people don’t get to Tomorrowland by accident. They’re chosen when they receive a pin that has a “T” embossed on it. For a time, they don’t know exactly where they are or why they’re shifting back and forth between two realities. If you’ve passed the age of 10 and still are paying attention, I’ll tell you that the movie’s two plot strands eventually merge. Robertson’s Casey Newton joins a reluctant Walker on a visit to Tomorrowland, where they trip out on manufactured wonder, run from evil androids and try to convince us that the world is worth saving. Bird has no trouble being visually creative as he spins a scenario in which he pays increasing homage to “special” people, the chosen few who presumably will save the rest of us from extinction. At one point, a rocket blasts off from inside the Eiffel Tower. A visit to a toy shop provides amusement. But the story isn’t exactly gripping, and it’s odd to see Clooney running around with kids in what sometimes looks like a massive hunk of children’s theater. Of course, there’s a villain: Hugh Laurie plays Nix, one of the more benign bad guys in recent movie history. At times, I wondered if Bird — who first forayed into live action with 2011’s Mission: Impossible — Ghost Protocol — might have had an easier time had he made Tomorrowland as animated feature rather than as a live-action movie that sometimes feels like an animated feature. And I never entirely found an answer to a question that bothered me throughout: What the hell is Clooney doing in a sci-fi movie with a Tinker Bell heart. Perhaps as an act of self-protection against those critics who aren’t impressed, Tomorrowland takes a stance against cynicism and negativity. It goes something like this: If you think the future will be a dystopian disaster, it probably will be. And aren’t big movies already propagandizing us for a horrible “destiny”? Sorry, I didn’t buy it. I’m not unduly cynical, but Tomorrowland didn’t do much for my today, although I have to confess that some days I wouldn’t mind getting a pin that could transport me to another dimension. But wait. I already have such a device. It’s called my imagination.